With the novelty of a quiet house for a brief morning, I was able to lay out the full extent of Harrogate to get a hopefully final fix on how big it will be. 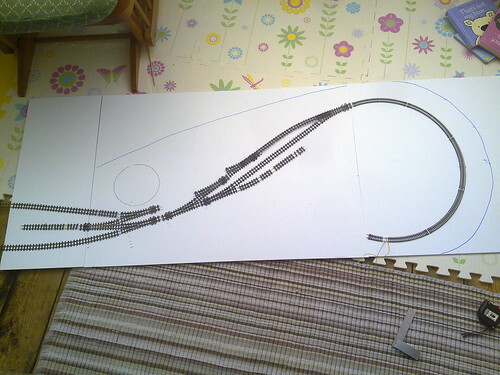 Using N gauge 1st radius for the 180° curve has helped to keep the overall dimensions under control – from the left hand end to the crudely drawn blue line it’s a maximum of 1.5m (~5″) long and a shade under 60cm (24″) deep. The result of this is that, based on a bit of scrabbling about in the boot with a tape measure, it should fit in the car in one piece. This obviously has a real advantage for the potential strength of the baseboard, not to mention simplifying the wiring and eliminating any issues with track alignment. I haven’t quite decided how the front edge of the layout will be angled, it depends where the gas holder and other scenic features are placed, but to make transport easier it will be wedge shaped to some extent. One thing I am fairly keen on is not having much in the way of a backscene, to allow for viewing from any angle. The next phase will be starting on a substructure from foamboard to hold the track bed – hopefully I will get a little bit more peace and quiet to make a start soon! This entry was posted in 009, harrogate, layout, model railways, narrow gauge, planning. Bookmark the permalink.